It is classically taught that when renal function is normal and the secretion of antidiuretic hormone (arginine vasopressin) is fully suppressed, the human kidney has the capacity to excrete large volumes of dilute urine, allowing for a broad range of water intake. This flexibility protects against the development of hyponatremia even in the face of water intake that can approach 20 L/d. What is not as widely recognized is the impact that alterations in solute intake, and therefore excretion, have on this process. As will be illustrated here, a decrement in solute intake markedly reduces the above-mentioned flexibility and puts the individual at risk for the unexpected development of hyponatremia. In contrast, an increment in solute intake can be used therapeutically to treat this electrolyte disorder and allow those prone to it to liberalize their water intake. Equation 3 not only reflects the well-established fact that as the urinary osmolality (Uosm) decreases the free water clearance commensurately increases but emphasizes that for any given Uosm it is the solute excretion that sets the ceiling as to how much free water will be excreted. This is illustrated in Figure 1. Thus, at a urinary osmolality as low as 60 mOsm/kg if solute intake is 900 mOsm/d, 12 L of free water will be excreted. However, if the intake of solutes decreases to 600 mOsm/d, 8 L can be excreted, and in the more extreme setting in which the intake decreases to only 300 mOsm/d, a mere 4 L of free water can be excreted. An intake of fluids that exceeds this volume will culminate in hyponatremia. 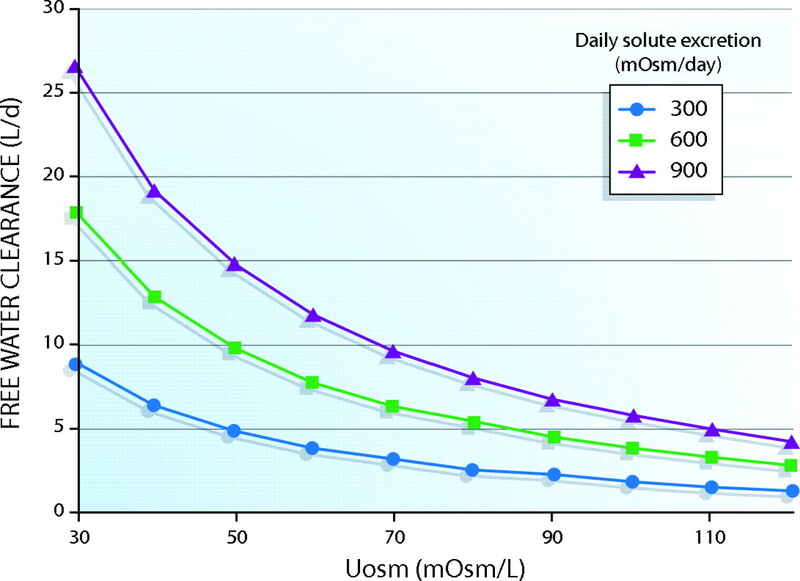 Dependence of water clearance on daily solute excretion at low urinary osmolalities. Data from reference 7, with permission. This is the mechanism that underlies the hyponatremia observed in subjects who drink large quantities of beer, so-called beer potomania,1–6 as this beverage is notoriously low in sodium content and their overall dietary intake is limited. However, this disturbance can be also seen in individuals who crash diet on a markedly restricted protein intake with a low salt diet in combination with generous (approximately 4 L/d) water intake.7,8 Restoration of solute intake reliably corrects the hyponatremia in these patients because they have no intrinsic defect in urinary dilution, as reflected by the excretion of a maximally, or almost maximally, dilute urine (<100 mOsm/kg). A decrement in solute intake also contributes to the development of thiazide-induced hyponatremia in the elderly. It must be noted the effect that alterations in water excretion have on serum sodium also depend on the nature of the solute that is excreted.9,10 Urinary osmolality is a function of both electrolytes (primarily sodium, potassium, and their accompanying anions) and urea excretion. However, because the latter readily crosses cell membranes and is not truly an “effective” solute, it has no ultimate impact on serum sodium concentration. In such a formulation, much more relevant is the electrolyte-free water clearance. In calculating this entity, the urinary osmolality is replaced by the concentration of sodium (UNa) plus potassium (UK), and the plasma osmolality by serum sodium (SNa). Note that, although this equation will more reliably predict the changes in serum sodium concentration, the overall rate of solute excretion (a major determinant of urine flow) will profoundly influence the excretion of electrolyte-free water as well. The excretion of urea is highly dependent on protein intake. Normally 50 to 100 mmol/d of urea are derived from catabolism. The balance is driven by protein intake, as every 10 g of protein consumed results in the excretion of approximately 50 mmol of urea. Furthermore, since in the presence of poor protein intake, urea excretion is also likely to be low, the values for electrolyte-free water clearance obtained from equation 4 will be only marginally higher than those for free water clearance derived from equation 3. Therefore, were free water clearance to be replaced by electrolyte-free water clearance in Figure 1, the curves would not be significantly altered. Effect of increasing solute excretion on urinary osmolality. 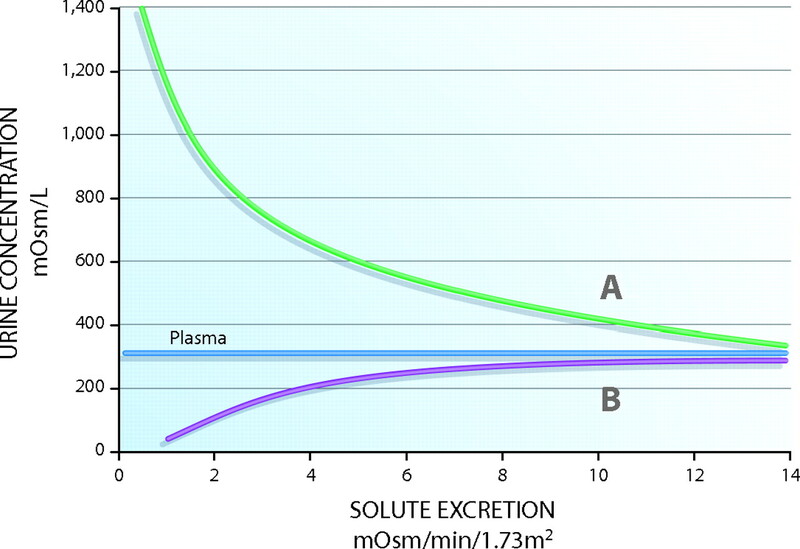 Note that solute excretion increases both in the presence of vasopressin (A) and in its absence (B). Uosm approaches isotonicity. Adapted from reference 12. Now this patient is actually excreting electrolyte-free water and a fluid restriction to approximately 500 ml/d will result in an increase in his serum sodium concentration. See related editorial, “Just Add Water,” on pages 1041–1043.